As the finishing touches were being completed on our feature home, the homeowners left for their honeymoon. 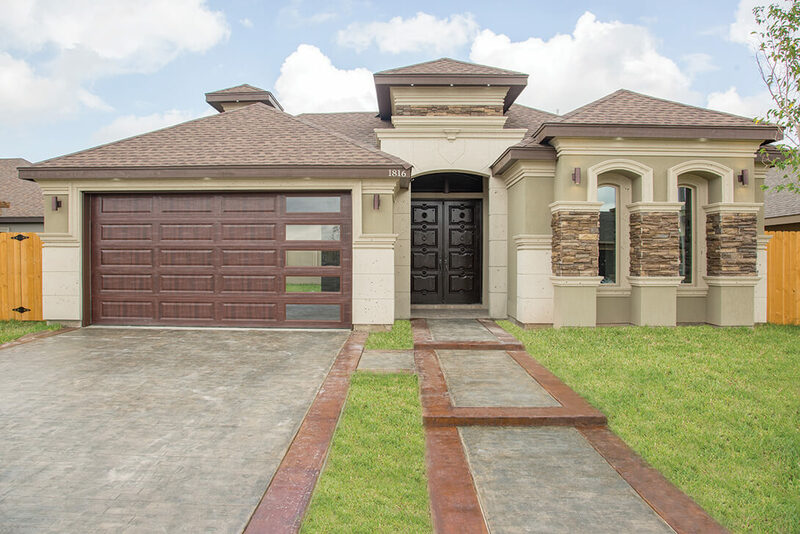 I can only imagine the anticipation they felt about moving into their completed new custom home by Mario Treviño of Treviño Construction, LLC. When the words newlywed and home appear in the same sentence, you may think of an apartment or a “starter home.” Renting a home used to make sense when couples were first starting out. With the cost of apartments on the rise, however, it makes better sense to purchase a property that you can build equity in. Historically, purchasing a “starter home” meant settling for an older smaller home in an affordable neighborhood. These were not “dream homes,” but they were a practical investment with a view to the future prospect of owning that dream home one day. Today’s buyers are not willing to settle. They want their dream home now. That trend is borne out in a survey conducted by Bank of America in early 2016. The research found that 75% of first-time buyers would prefer to skip the starter home stage and find a house that meets their present and future needs. More than one-third of those surveyed (35%) said they intended to retire in their first home. This is due, in part, to a change in attitudes over the past 10-20 years. Millenials are inclined to purchase smaller homes because it gives them greater financial freedom and reduces their ecological impact upon the environment. Builders have been responding to this change by offering newly constructed starter homes. Today, they account for 36 percent of U.S. home purchases, according to data collected by the National Association of Home Builders. The concept of a “dream home” is very subjective, but to many, it means a newly built home that has a modern or contemporary look and feel and the requisite wiring for the latest technology. This includes the style and amenities of an upscale home made with the high-quality materials that are usually reserved for luxury homes. Mario Treviño creates a product that caters directly to these home buyers. His homes are custom designed to meet the specifications of the homeowner. By today’s standards, this 2,060 sq. ft. home is relatively small. This means that the cost of materials is greatly reduced. That saving leaves room for luxury items. 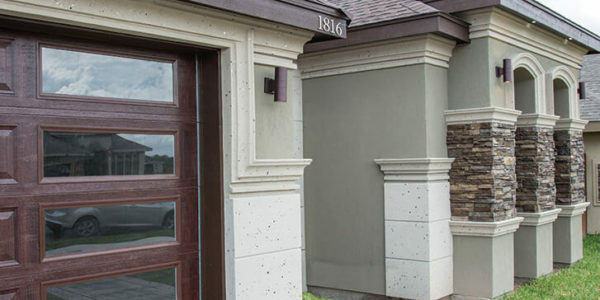 Brilliant architectural features give the look and feel of an upscale home. For example, the open concept living, dining, and kitchen area each has unique features. The dining area has a coffered ceiling accented with a shiny chrome chandelier. Three niches with stone veneer walls complete the scene. The color palette is neutral but very bold. Highly sophisticated designs were created by layering cream, medium brown and dark brown. The colors and textures evoke an emotional response due to the high contrast in the overall design. Any bright colors the homeowners decide to add to the composition will work within this foundation. Angular and curvilinear elements are utilized about equally in the overall design of the home. 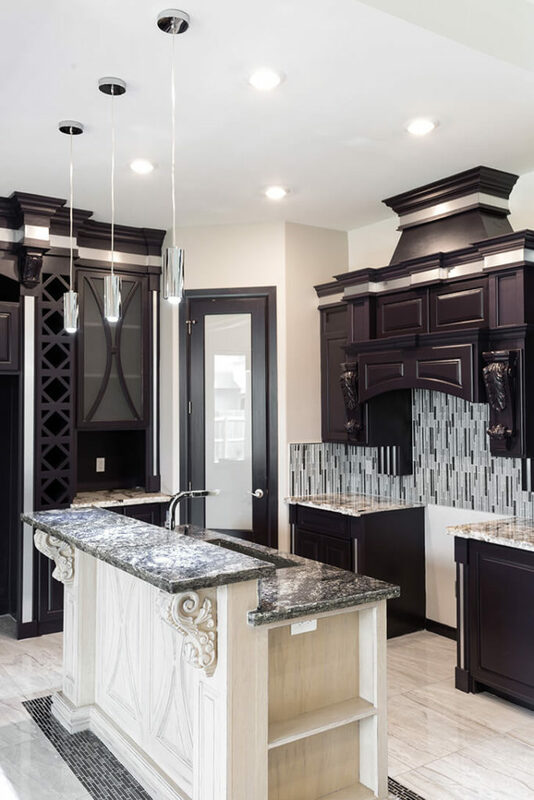 The crisscross design in the coffered ceiling is repeated in the wine bottle rack in the kitchen. Next to the wine rack, is a frame and mullion cabinet door with a curved design element. This design is elaborated upon in the multi-level tray ceiling in the living area. 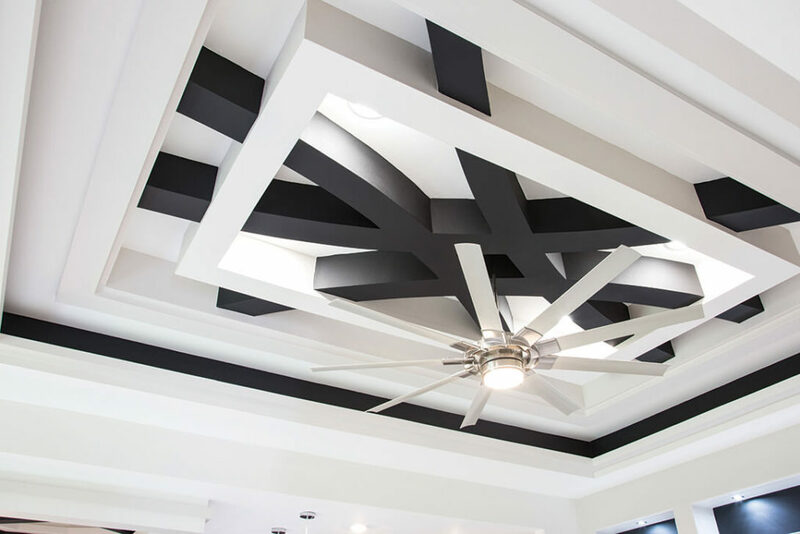 A tray ceiling is a recess that resembles an inverted tray. Most often it is rectangular, but it can be other shapes. The tray ceiling is intended to create architectural interest by breaking up a flat ceiling line. A nine blade fan/light adds another layer of visual interest to the design. 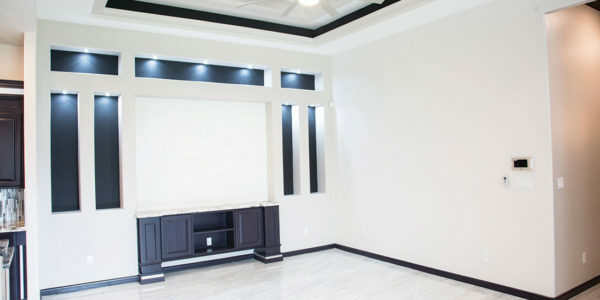 An arrangement of narrow rectangular LED lighted niches is built into the living room wall, with a large one for a flat screen t.v.. A built-in cabinet under the space for the t.v. gives the appearance of a furniture piece. The narrow niche walls are painted the same color as the built-in for a dramatic effect. Built-ins enhance the visual appearance of a room and add value to the home. In the kitchen, traditional cabinetry is combined with contemporary elements. The cabinets are painted a rich espresso color. With the ongoing popularity of stainless steel appliances, it is not surprising that buyers would like stainless steel trim in their homes. 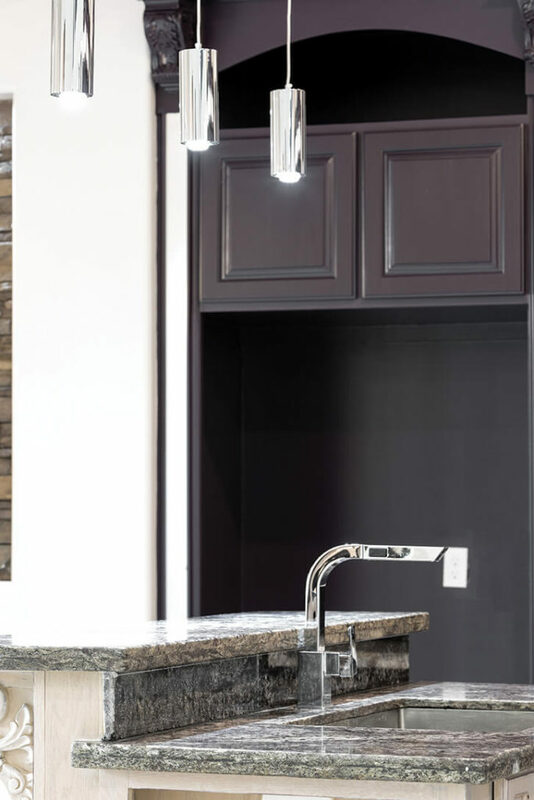 The trim detailing is featured on all the dark colored cabinetry. The perimeter counter tops showcase a cream granite with dark veining. 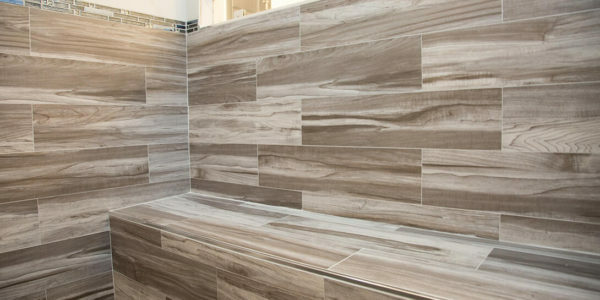 The backsplash is a sophisticated glass tile mosaic. The kitchen island looks like a special piece of furniture. The side that faces the dining room is embellished with the curved design from the cabinet and acanthus leaf corbels that support the narrow raised bar. Substantial baseboard molding accents the base of the island and a dark linear glass tile border inset in the floor, around the perimeter, anchors the island. Distressed cream colored paint reinforces the traditional look. The kitchen side of the island contains the usual storage cabinets and an undermount stainless steel sink with a contemporary chrome faucet. 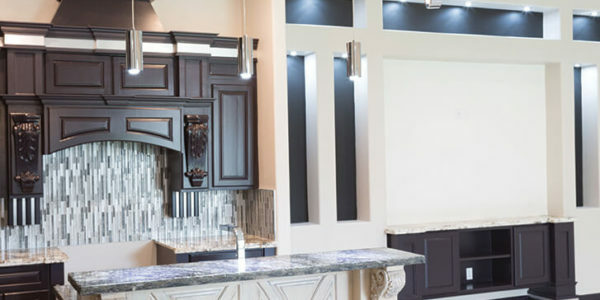 The “mix and match” look is finished with a dark granite countertop that completes the design. Walk-in pantries are a home chef’s best friend, so naturally, they installed one in this home. They take the cake when it comes to sheer volume of storage space. With multiple walls of floor-to-ceiling shelves, they’re big enough to store dozens of ingredients, cookbooks, snacks, pots, pans, medium to large cooking appliances and more. Just off the dining area, a recessed entryway into the master bedroom provides a sense of privacy. 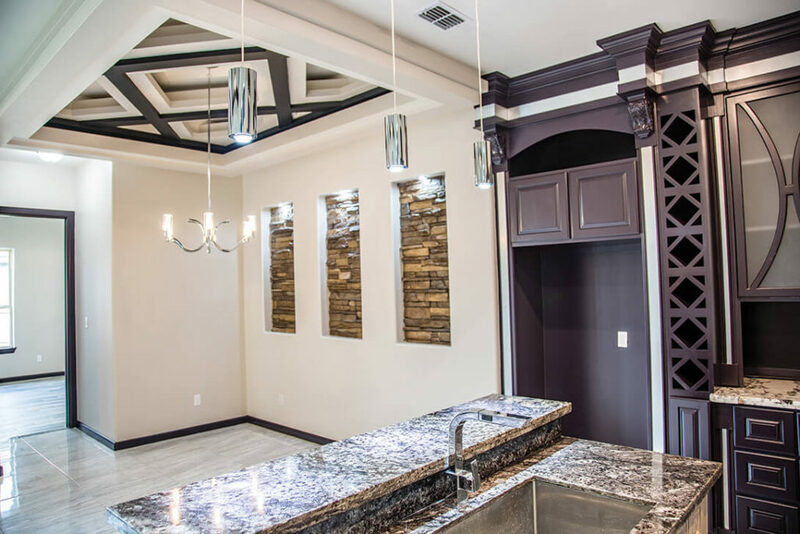 A coffered ceiling and porcelain wood-look tiles provide the base for a luxurious room. There is a large walk-in closet, and a spa style bathroom decked out in a frameless glass shower with dazzling tile. A long countertop features a set of black glass vessel sinks with waterfall faucets. They look elegant on the striking high-contrast granite. A surprising feature, in this home, acts to create an expansive area for outdoor entertaining. The living area overlooks a courtyard at the side of the house. Access to the yard is through a set of French doors. A travertine walkway leads around to the back of the garage. The surprise is that the back wall of the garage is completely open. A built-in barbecue is conveniently placed near the opening, and there is an entrance to a powder room. Move the cars out of the garage and the whole neighborhood can be invited over for a party. As much attention to detail has been given to the exterior of the home as the interior. 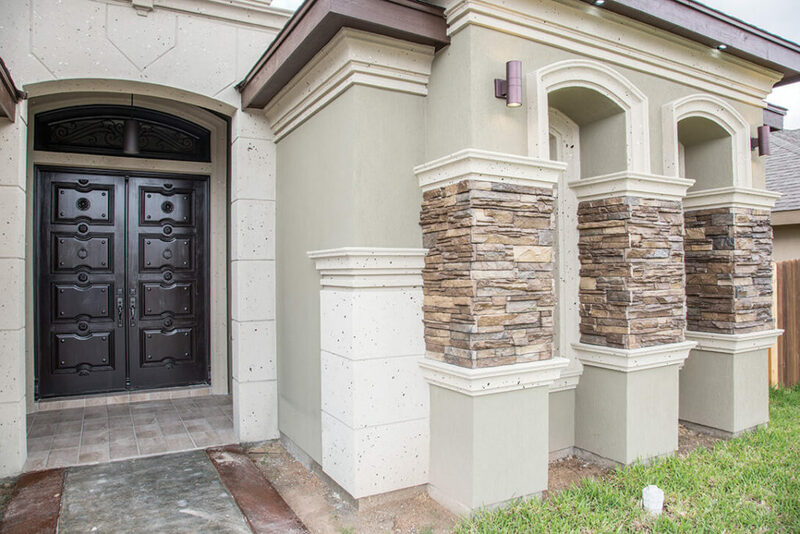 The structure is wood frame finished with stucco and a “cantera finish.” Surface embellishments include cantera window trim and stone veneer. The walls are insulated with foam, and the windows are an energy-efficient double pane. Entrance to the home, from the street, is along a pavement that has a border etched into the cement. The border is stained with a rust color. The front door makes a grand first impression because it is a tall double mahogany door with carved lion’s heads, rosettes, elaborate trim, and a metal knocker. A transom window, with a decorative grille, allows light into the foyer. They did not miss a design beat, by installing a garage door with a wood-grain finish. 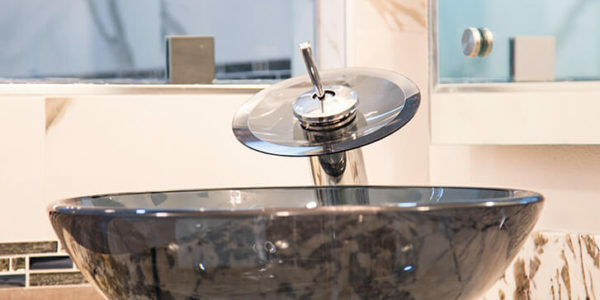 Our featured home exhibits a pride of craftsmanship and luxury style that consumers are searching for. Whether you are a first or last time home buyer, you will appreciate what this builder has to offer.